She works in the Lac Tele Community Reserve which was created in 2001 to manage the area’s biodiversity-rich flooded savanna forest. I met Christlia at park headquarters in Epena while on mission to lend environmental governance support to the park’s community development team. The Reserve is located in the Republic of Congo just across the Lac Tumba Reserve in the Democratic Republic of Congo – the area constitutes the world’s largest peatland. The American environmental NGO Wildlife Conservation Society manages it in tandem with the Congolese agency for nature conservation (ACFAP). Population density is low – less than three inhabitants per square kilometer – which facilitates conservation efforts. Local communities in the reserve draw their subsistence mainly from fishing, and depending on the season, from hunting and farming. Harvesting of non-timber forest products such as caterpillars and mushrooms contribute to diets in the lean months from July to September when fish is scare. Dugout canoes, fishing nets, woven-rattan traps and harpoons are the symbols of community life. Other than selling fish and bushmeat, economic activities are limited, so families survive largely outside of the cash economy. There is indeed a pattern of frustration that started with skepticism but has mutated into anger. WCS is promoting cacao production but villagers admit that between the painstaking growing of cacao and hunting, the economic choice is simple: ‘we only get 600CFA for a kilo of cacao whereas a duiker can fetch five times as much’. A day in the life of a park ranger is physically and emotionally exhausting. ‘A patrol can last up to three weeks in the forest. I carry a gun and a heavy pack filled with cans of sardines and corned beef, my tent, GPS and satellite phone in case we have an emergency. We go days and days without washing up – and that’s no joke. It’s never happened to me but colleagues have met up with family members with guns and animals that are on our country’s protected species list. What are they supposed to do? Uphold their conservation mandate or get into trouble with the family?’ Tasks in this mandate according to Christlia are anti-poaching, wildlife tracking and stimulating community awareness. 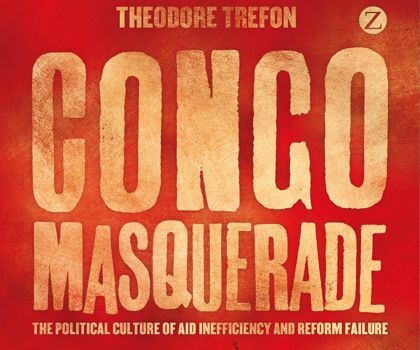 Theodore Trefon (PhD, Boston University) is a Congo expert specializing in the politics of state-society relations. He has devoted his career to Congo as a researcher, lecturer, author, project manager and consultant. His current research at the Belgian Royal Museum for Central Africa focuses on environmental governance. Copyright Theodore Trefon. Powered by Blogger.